Hey, I figured I'd give this thing a shot. I have no idea what I'm doing here so this could take a while! In the pic is Snuggles (in back) and Big Bubba Jones (in front). 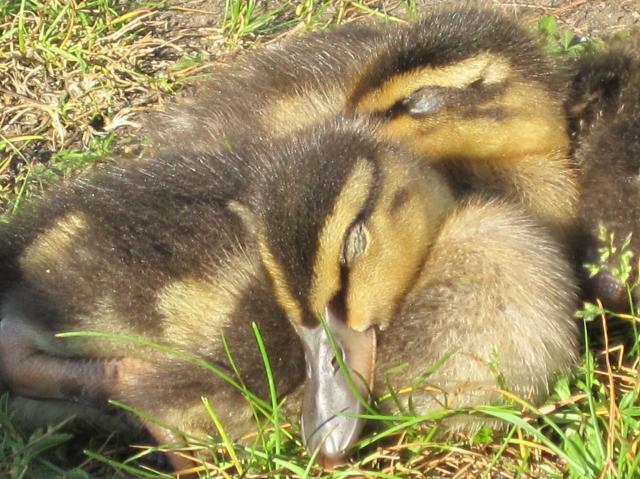 These were our first ducklings. They weren't even supposed to be ours. There were 4, they were hatched as a school project and all 4 were supposed to go to a farm. We volunteered to care for them over the long weekend and noticed that there was something wrong with Snuggles...she never walked. We also noticed that the others seemed to stumble and trip a lot but we had never had ducklings before so we didn't think anything of it. We feel head over heels for these guys and it broke our hearts to have to give them back after the 5 days we had them. When they went back to the school we told the people in charge of the project about little Snuggles. A week went by and we were asked if we wanted to take Sunggles and Bubba back for good since Snuggles was disabled and wouldn't fare well on the farm. We didn't hesitate. They were back with us for a week or so and they were instant members of the family. They loved to be held and cuddled. They went in their brooder only to sleep. Otherwise they were always with us. Bubba was getting around nicely and we carried Snuggles everywhere. One afternoon Bubba took a tumble and we knew right away something was wrong. I rushed him to an emergency vet expecting them to tell me he had damaged a wing or a leg. When the tech told me that he had suffered head and neck injuries comparable with falling off a building I was shocked. When he told me there was nothing they could do and they lost him I was crushed. Poor Snuggles was peeping like mad for her best bud when I came home empty handed. I spent the night on the couch with my hand in her brooder to keep her calm so she could sleep. The next day I noticed Snuggles wasn't moving around normally. I put her in the tub for a swim and noticed something wrong with her left leg. Back to the vet. After a set of xrays I was informed that she had broken her leg while trying to walk. Apparently my downy babies had been born with a bone disease, like brittle bone in humans. The condition was so bad in Snuggles that her hip bones hadn't even fused together properly and her legs and spine were curved. Not only would she never walk, she would be breaking bones just trying to drag herself a few inches. The legs were so bad that the vet couldn't even set the break without causing more injury. I didn't want to put her down but I couldn't let her live in constant pain either so I said goodbye and went home empty handed for the second time in twelve hours. The only thing worse then loosing them both was having to break the news to the kids. They were devastated. I couldn't believe how attached we had grown to these fluffy creatures in such a short time. We all knew that, while we'd always love and miss them, we couldn't go back to be duckless. 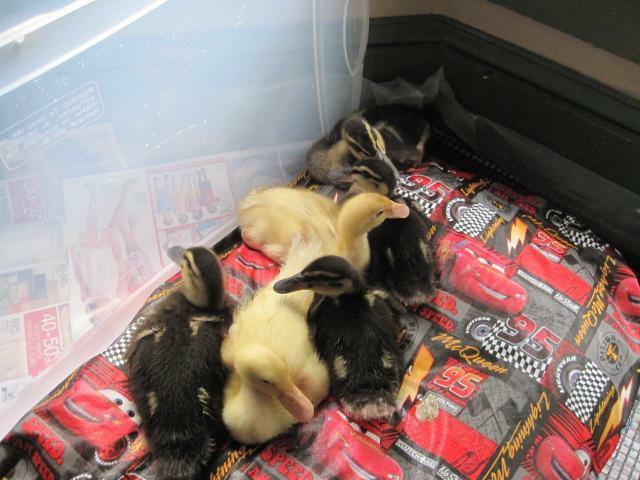 A couple weeks later 4 day old ducklings arrived from Metzer Farms and a few hours later that same day 2 more joined them (a gift from the school who gave us Snuggles and Bubba). Here's our "broody bunch" day one. 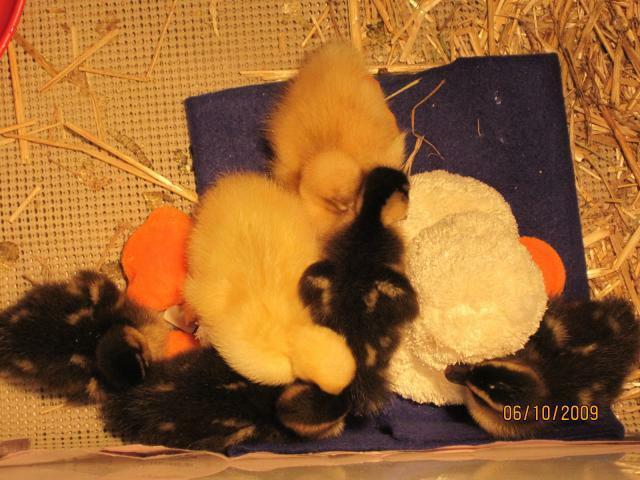 2 Runners - Snugglz and Troublz, 2 Rouens - Sweetie and Odie, and 2 mallards - Squeakers and Lady Jumpsalot. And the crew today - exactly 2 weeks later and 3x the size!